The history of Cuban international collaboration is marked by adherence to ethical precepts established in our state’s conduct and positions. Our government does not interfere in the internal affairs of any country and respects national sovereignty and international law. The hundreds of thousands of compatriots who provide their services on five continents believe in, and abide by, these principles. Thus, strengthened by these beliefs, we work in the homeland of Bolívar and Chávez. The Bolivarian Republic of Venezuela has welcomed the second largest number of internationalist Cubans, since January 1, 1959, surpassed only by the sister nation of Angola, which lived, worked, fought, and died with a great number of our sons and daughters. Venezuela is also the country in which Cuban collaborators participate in the widest range of sectors, including sports, culture, education, communications, agriculture, the food industry, science, energy, and transportation, among others. With the popular victory and the arrival of Comandante Hugo Chávez Frías to the Presidency, the Bolivarian Revolution put human beings at the center of its work. For the first time, many marginalized and poor Venezuelans were treated like valued citizens, with access to social programs that the government implemented, backed by 73% of the GDP investment to benefit the majority. Thus the social missions emerged, created and driven forward by Chávez as “the soul of the Revolution,” given their inclusive, popular, participative, democratic, human, solidary, and genuinely socialist nature. Within this context, into the heart of the people and their revolution, came Cuban collaborators. Fidel delineated the fundamental principles of the cooperation: First of all: serve the Venezuelan people well, prepare those who will follow us, and care for our brigades. These premises have been, are, and will be what guides the Cuban presence in this sister country. Misión Barrio Adentro Salud (Into the Neighborhood Health Mission) has had the greatest impact. Our collaborators are distributed in 24 states and 335 municipalities of the country. They live in all parishes and offer services in more than 1,500 facilities. They can be found on the steep hillsides, with the poor, and just as easily on the rolling hills where the rich and middle class bourgeois population lives. Everyone knows the reality in Venezuela; assistance is based on medical ethics.No one is asked about political affiliation or payment. They are people, patients, human beings … and that is enough to sensitize doctors trained in the values ​​of the Revolution, which speak for themselves, no inoculation is needed. Examples abound in the daily work and at exceptional moments, such as those during the opposition thug violence (guarimbas) of 2017, or January 22-23 this year, and even more recently, on February 23, when those who suffered gunshots, blows, and even burns, both Chavistas and supporters of the opposition, were treated by Cubans at Comprehensive Diagnostic Centers, all with the same disposition and quality attention. At these centers, after a clinical examination, the most direct, effective method of identifying an ailment, patients without distinction may undergo tests, receive treatment with medication, rehabilitation, or surgery, and, if necessary, specialized assistance in Cuba. Supervision? Yes, it exists, but differs significantly in focus as compared to what the enemies of Cuba and Venezuela propose. As in any other part of the world, statistics are gathered, not in the mercantilist sense, but to evaluate the impact of treatment and preventative work on health and quality of life. In the 18 years since Misión Barrio Adentro Salud was launched, 1.552 billion medical consultations have been provided, 1,473,317 lives saved, and 3,391,967 surgeries performed. Among the 10,388 services offered are assistance to the disabled, orthodontics, ophthalmological treatments, and ongoing support for patients with chronic diseases like diabetes. In only ten years, 209,607 patients suffering from diabetic foot ulcers have been treated with HebertProt-P, a high-impact product of Cuban science, which has contributed to lowering amputations to 3% among those treated, while Venezuelan statistics show that 40 to 60% of patients who do not receive the Cuban product require amputation. Something that distinguishes the work of the health system developed by the Bolivarian Revolution through the Barrio Adentro mission – first with Cuban doctors and now with the new generation of Venezuelan community doctors in the 13,617 popular clinics – is field work, door to door, with integrated teams and the participation of other community actors, not to seek votes or apply political pressure, but to practice social medicine, that which, from the soul, cures disease. Grateful Cubans remain in Venezuela, voluntarily and with a high sense of courage and revolutionary integrity. Those who fulfill a solidary duty remain united with Venezuelans in the face of aggression and threats from imperialism and its lackeys. Only those who came looking for the good life have abandoned the cause. There are no Cuban agents or soldiers on Bolivarian soil, only collaborators who value peace, love, and life, who teach and learn every day. As in Cuba and through Mission Robinson – a name taken from the pseudonym of Simón Bolívar’s teacher – 3,095,546 Venezuelans have learned to read and write, using in this lofty cause Cuba’s “Yes, I can” method. We can affirm with certainty that the Venezuelan people are now more cultured and freer; thinking, reasoning, and deciding their own future, thanks to the social missions of Venezuela and Cuba. Constitutional President Nicolás Maduro Moros has strengthened the Hugo Chávez Frías Missions and Great Socialist Missions System, reaffirming that they constitute a source of social, economic, and political power. Shoulder to shoulder, for peace and love, Cubans will always accompany you. No Cuban doctor denies service to a patient and much less risks the life of one to achieve political ends. Cuban international medical collaboration has existed for over 55 years and has a presence in 124 countries, with more than 400,000 health workers providing services. 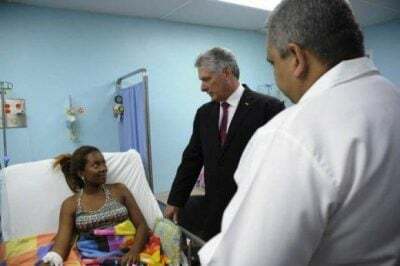 Since Cuban medical collaboration began in Venezuela, more than 140,000 health workers have participated, offering millions of medical consultations, while more than 24,000 Venezuelan community doctors have been trained. The Barrio Adentro I and II missions have brought health to the people, altruistically, as characterizes our professionals. Only those who support the coup from abroad would attempt to sully their honor. Cuban collaboration in Venezuela is an expression of the solidarity defended by Fidel and Chávez. More than 220,000 Cuban specialists from different sectors have served on Bolivarian soil over the years. This is the real Cuban army, not the one that coup leaders concoct.